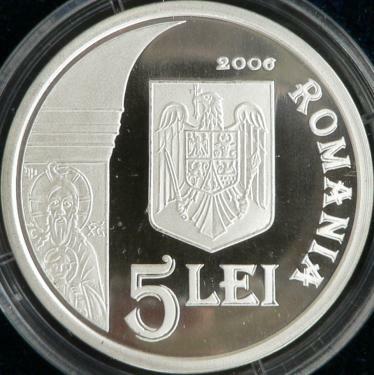 Obverse: face value 5 LEI, year 2006, Romanian coat of arms, ROMANIA, image of a part of the central supporting pilar of the church, with the icon named "Holy Trinity of Densuş" Reverse: the church, viewed from the apse with the altar, a part of the central pillar, containing the grave stele of the Roman general Longinus, inscription BISERICA DE LA DENSUS meaning "CHURCH OF DENSUŞ"
The church was built in the 13th century AD. It is dedicated to Saint Nicholas. 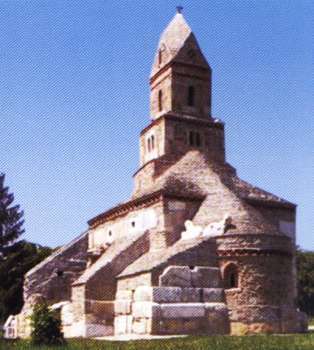 In the same period were built in Transylvania some other Orthodox stone churches: at Gurasada (~1250), Strei (~1280), Sîntămăria Orlea. In the 13th century some papal bullae requested the suppression of the liberty of cult for the Orthodox believers in the countries ruled by Roman Catholics. So, almost all along the Dark Ages, the Romanians from Transylvania were not allowed to build stone churches, just wooden ones. The Densuş church has a belfry with stone roof. On the roof, approximately above the altar, there are two stone lions. A great part of the construction material used at the building of the church was taken from the ruins of the Roman city of Ulpia Trajana, that lies nearby Densuş. To the church building architraves, doorsills, votive altars, columns and capitals were used. The church foundations belonged to a much older building, a Roman villa rustica, a temple dedicated to the god of war Mars or maybe the mausoleum of the Roman general Longinus. In 1443 the Orthodox church of Densuş, founded by the Romanian princes (cneji) from the Mănjina family, was painted by Ştefan, the first Romanian mural painter known to Romanian history. The icon "Holy Trinity of Densuş" shows Jesus as a child, dressed with an "ie" (an embroided Romanian blouse) with traditional motifs from Ţara Haţegului (Country of Haţeg). Unfortunately, on the coin appears only the head of Jesus. The Father appears like an old man with long beard and the Holy Spirit as a pidgeon. "It seems that a local craftsman improvised here, with models borrowed from the Romanic arhitecture and with material that came from dismantling ancient buildings, a Byzantine church of a type that he knew only from hearsay, thus realizing a rustic synthesis, but suggestive, of the artistic currents that crossed the Transylvanian land." The quotation is from the volume "Istoria artelor plastice în România" - History of the Plastic Arts in Romania, 1968 - written by a group of authors. The quoted fragment belongs to Virgil Vătăşianu. Cneius (or Gnaeus) Pompeius Longinus commanded the Roman garrisons from Dacia after the first Roman-Dacian war from 101-102 AD. He was consul in 90 AD. Captured by king Decebalus in 105 AD, he commited suicide. In exchange for freeing Longinus, Decebalus requested some war compensations and the withdrawal of the Roman army from Dacia. A well spread hypothesis says that one of the Roman tombstones used at the construction of the church of Densuş belonged to general Longinus. 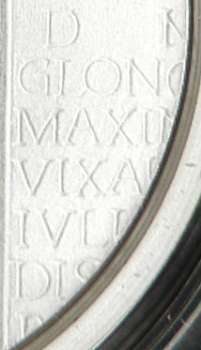 The funeral inscription is: D M / G·LONGIN / MAXIMO / VIX AN LVIII /IVLIA·AFRO / DISIA CONI / B M P (the inscription in partially visible on the coin). D M means D(iis) M(anibus), and is an invocation to the Manes gods. G Longin Maximo is the name of the deceased, probably at dative case. VIX(it) AN(nis) LVIII shows that Gaius Longinus Maximus lived 58 years. The last two rows show that Julia Afrodisia, the wife of the deceased- CONI(vgi) - put this tombstone. B M P stands for Bene Merenti Posuit. So, the funeral inscription can be read as: for the Manes gods, for Gaius Longinus Maximus, who lived years 58, Julia Afrodisia wife (because he) well deserved put (this tombstone). The commune of Densuş from Hunedoara county has 2-3000 inhabitants. It is placed near the city of Haţeg and the ancient city of Ulpia Traiana Sarmisegetusa. 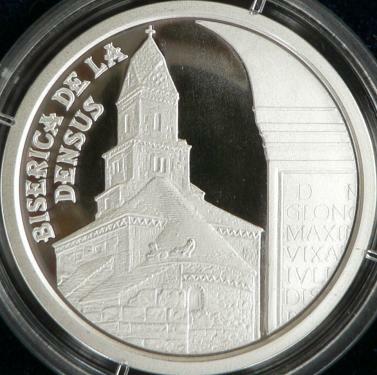 The 5 lei 2006 silver coin (Densuş Church) pictures above are present on the site through the permission of an anonymous donor.